Downtown, City-owned parking lots and on-street parking are regulated Monday through Saturday 8 a.m. to 6 p.m. Parking Services monitors these areas to ensure parking turnover in the downtown area. The City of Fort Collins has a variety of parking regulations. The following includes highlights of the most common regulations. Parking is enforced Mon-Sat 8 a.m. to 6 p.m. The City of Fort Collins, Downtown Business Association and Downtown Development Authority work together to address downtown parking problems. Limited downtown on-street parking means those planning a stay longer than two hours should use a parking structure or outlying parking. If a street has no posted time restrictions, vehicles may park all day. As a customer-friendly courtesy, the first overtime violation receives only a warning. The intent is to prevent repeat offenders, so fines will go up dramatically for recurring violations. Time limits encourage people to move their vehicles to increase parking turnover for downtown businesses, customers and visitors. When leaving a timed parking space, it is not permissible to return and park in the same block face for at least four hours. Even if you parked for only 10 minutes, you cannot return and park in the same block face for at least 4 hours, or risk getting a citation. 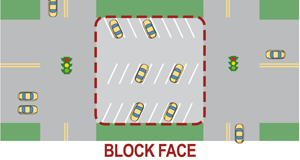 A block face is the portion of a street between two intersections, including all on-street parking, both sides and center(where applicable). The parking areas are enforced by what is called "chalking," which is done electronically by entering the vehicle's license plate number into a handheld computer creating a unique database for each day and location. Loading zones are to be used for the purpose of, and while actually engaged in, loading or unloading property or passengers, and vehicle flashers must be on. Loading zones are not considered parking places and will be enforced accordingly. Loading zones have a 30-minute time limit. Loading zones have a 30-minute time limit. Any vehicle left unattended at one location in the public right-of-way for 48 hours or longer is considered abandoned. If not removed within 48 hours the vehicle will be subject to tow at the vehicle owner's expense, and storage costs will begin to accrue. Any car unattended IN THE PUBLIC-RIGHT-OF-WAY for 48 hours or longer is "abandoned"
This list below not intended to be all-inclusive. For a complete list of enforceable parking regulations please refer to the City of Fort Collins Traffic Code.